The fourth in a series of posts about the exceptional food I ate in 2.5 days in New York. Brunch in the garden at Le Gamin on my second morning in New York: a perfectly poached egg atop a wedge of chevre-potato cake, surrounded by ratatouille. Café au lait served in a bowl. Sunshine and a cool breeze. Benignly negligent service balanced by excellent people watching. Good company. A lovely way to start the day. After Monday’s workout, I felt pretty good! Sure, I could barely do any of the push-up type moves, but I rolled and banana’d and lunged my way through the rest of it without feeling like I was going to barf. I had a bit of residual soreness on Tuesday – just enough to remind me that I’d used muscles I don’t use very often. I was feeling good! And then came the 3.25 mile run home. As I mentioned, I’m subbing in running for the Cardio X, Kenpo X, and Yoga X workouts, with progressively longer distances and/or intervals as the week goes on. I headed east from work and looped around the track at Palmer Field, where I expect to start running intervals on Thursday. At some point between Kerrytown and home, my belly started aching. Was I hungry? Was this runner’s gut? No. This was CORE SYNERGISTICS coming back to haunt me. Hello little core muscles! Thanks for making it painful to cough, sneeze, or laugh! Tonight I came straight home with my delicious farmers’ market goodies (sweet cherries, sour cherries, tomato, cabbage, and SMOKED FISH), plopped everything in the fridge, and hit the deck for Shoulders & Arms. And man, did I bring it. I’m still figuring out the Bowflex adjustable dumbbells, but I did my best and upped the weight on most of my second sets. I even did the bonus round, grunting my way through the last few reps. I am going to be S O R E tomorrow! After checking in with Shane on dinner, I tried my best to bring it with Ab Ripper X, but only made it about halfway through before I had a danger sign: my hip popped. This isn’t uncommon for me, but does give me a very legitimate reason to pause the workout. I’m going to have to figure out how to make this work. Days 2 and 3: Brought. The third in a series of posts about the exceptional food I ate in 2.5 days in New York. A few weeks before my trip, I posted a request for restaurant recommendations on Twitter and Facebook. I ate well on previous trips to New York, but have gotten significantly more into food since my last visit in 2008. I’ve also made a few friends who are very into both food and New York. I was also thinking of this trip as my reward for making it through my first semester of teaching – so I was willing to swing a slightly higher food budget than I would’ve normally planned for a solo trip. On my first actual evening in New York, Carrie and I grabbed dinner at a sweet restaurant in her neighborhood that she’d often walked by but hadn’t had the excuse to try. James was both upscale and welcoming, a small space packed full of people yet still surprisingly intimate. A family of three was seated at the table next to us, the small child playing with toys and eating bites from his parents’ plates throughout the meal. The next table over was a birthday party. 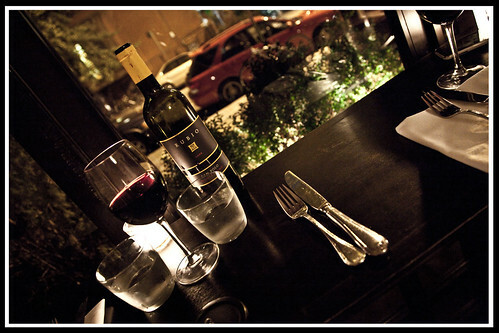 There were couples out for a private meal – and then the two of us, hungry and tired after long days. I wish I had photos of the food we shared, but the lighting was low and the food too delicious to wait. We shared three small plates: a fancied-up shrimp and grits – smooth and rich, with a spicy harissa jus – and the asparagus, grilled or roasted and served with an impossibly wonderful Taleggio cream. Oh, and herbed fries, because what meal isn’t even slightly improved by the addition of fries? All in all, a wonderful dinner, followed by Italian ices and a walk with a very cute dog through a very lovely park. One picture of me from the whole damn trip, and I have my eyes closed. It figures. At least it was because I was happy walking from Prospect Heights all the way to Manhattan by way of the Brooklyn Bridge. And that, my friends, is what they call “fake it til you make it”. Because that is what I had to do to get through CORE SYNERGISTICS tonight, what with the five or six kinds of pushups and the “superman banana” sequence. If I can set one goal for myself for this whole P90E process, it will be to be able to do a real push up and also a real pull up. Right now I can do neither, and it showed in this workout. The High Line from Gansevoort Plaza to Rainbow City at 30th St and 10th Ave.